1895 — Formally recognized as a heritage structure, Peterborough’s downtown YMCA was built in 1895 by local architect William Blackwell. Over the years, the building has expanded and changed to meet the needs of a growing number of patrons. 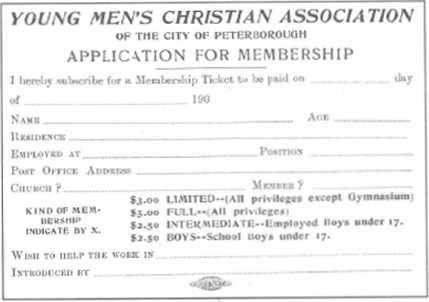 Thanks to a donation from Charlotte Nicholls, the widow of prominent businessman Robert Nicholls, the Peterborough YMCA was able to begin construction. 1930s — The first addition to the YMCA consisted of a handball court, a club room and three more dormitories. Also, included was a swimming pool to be used for diving events, swimming |competitions and lessons. 1969 — The second expansion, designed by prominent Toronto architects Craig and Zeidler, included a youth centre and an additional Olympic-sized aquatic area. 1978 — The final addition to the YMCA building was completed in 1978 and consisted of an Olympic gymnasium, new handball and squash courts were created, and some improvements made to existing facilities. 2007 — Alas, the YMCA’s time at the corner of Murray and George Streets came to a close as everything was packed up and moved to a new location. Effectively closing a chapter in the life of this historical building. 2017 — The year that signifies the rebirth of a true local icon. As luxury condo-style rental suites breathe new life into the historic YMCA Building in downtown Peterborough. 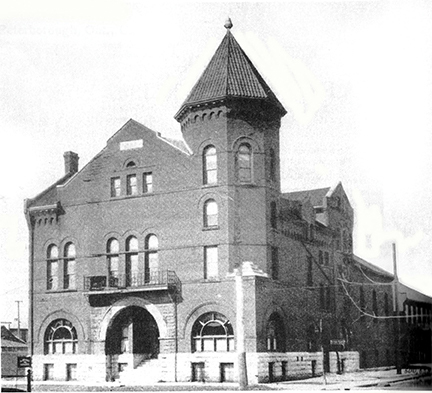 The original Peterborough YMCA structure as it looked from 1896 to 1930. George M. Roger; President, 1883, 1887-90, 1893-95. One of the men of vision and tenacity in the early days of the Perteborough YMCA. 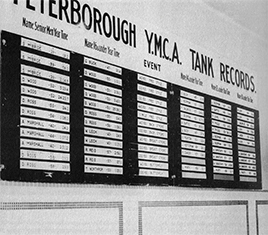 Up until it closed in the early 2000s, the downtown Peterborough YMCA was home to a wide range of activities. It was a place to meet, exercise, take part in various clubs and activities or go for a swim on a hot day. In the 1920s, the YMCA gym featured rings hung from the ceiling, which young boys used to swing from one end of the gym to the other. Up three flights of stairs in the tower, you’d find the popular handball court; one gentleman recalls that you got most of your exercise just climbing up there! In those days, Saturday mornings at the YMCA often saw an excited group of young boys gathered to watch Charlie Chaplin movies. In the afternoon, they could enjoy hobbies, such as wood working, model airplane building and more. 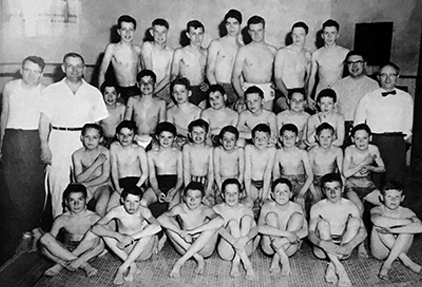 In 1955 the YMCA introduced a swim club, and in 1956, a Judo club, while the 1960s, programs were broadened to include pre school-age children, as well as women and girls. The 1970s saw more exotic options introduced, including personalized fitness and aerobic classes, not to mention belly dancing. Atria Development is proud to have the opportunity to bring residential lofts to this historically important building and make it again an active part of Peterborough’s downtown. The early Romanesque façade will be preserved, and where possible, the concrete structural elements of later additions will be reused so as not to waste resources. It is an honour for Atria to be able to maintain the YMCA’s landmark presence and its place in the city’s collective memory.